Caring for someone with Alzheimer’s is both emotionally and physically draining, requiring fortitude and patience. People who are suffering from Alzheimer’s need help with daily activities. As the disease progresses, independence is lost and the client often feels isolated and confused. Alzheimer’s disease leaves families at a loss for how to help their loved ones. It is imperative that people with Alzheimer’s have access to qualified caregivers who are compassionate and patient. Through our comprehensive Care Match Program, Value Care connects people suffering from Alzheimer’s with the best caregivers. Our rigorous screening process and FIVE STAR PROMISE ensures that each caregiver we refer has more experience, skills and core understanding. We check that each caregiver has ample experience and understanding, solid references, the ability to pass written and verbal communication tests and a mastery of transfer techniques for safely moving clients. Because hands on care for those with Alzheimer’s can be expensive, we are also passionate about referring caregivers at lower cost so you can afford the care you require. An extra hour of help can make all the difference. Our clients choose where and when they receive care. If you need a caregiver to visit once a week and help around the home we will find you the best candidate for the job. If you need around the clock companionship, or someone to help run neighborhood errands, we can find someone for that as well. We genuinely care about our clients and do all we can to make sure their schedules and care needs are met and exceeded. 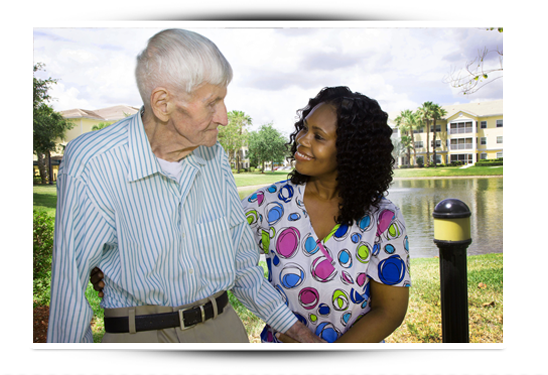 We offer a First Day Satisfaction GUARANTEE to make sure you are happy with your loved one’s personal caregiver. The caregivers we connect with our clients are patient and caring, and are aware of the struggles that people with Alzheimer’s have to endure. Mood swings and bad days are not uncommon in Alzheimer’s patients, and often times patients are depressed and simply need someone to be with them. Consider Us if you are currently caring for a loved one with Alzheimer’s and need some extra help. Our clients save up to 25% or more off average industry prices on Alzheimer’s care. Call Us Today to see how we can help.